Original instrumentation is shown here. The new configuration will consolidate vital instruments into the new helm pod. FLOSCAN's multifunction series will be part of that pod allowing the current fuel tank level module to be moved to a less conspicuous location. FLOSCAN provides tach, engine hours, total gallons consumed, and nautical MPG all in one compact instrument. I consider FLOSCAN a vital instrument. 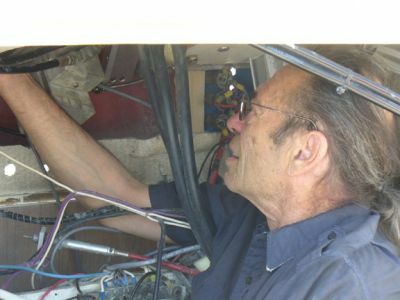 Abnormal fuel consumption can help detect engine, gear or prop problems. 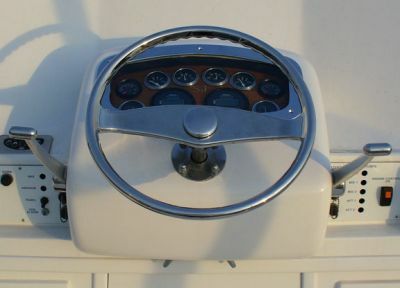 It also helps determine the optimum operating RPM and cost for the boat and conditions. 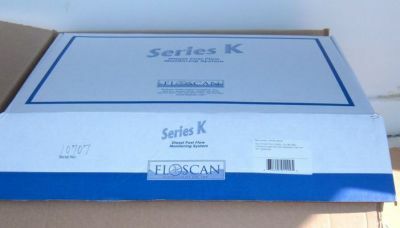 The FloScan kit arrived in serial numbered boxes. 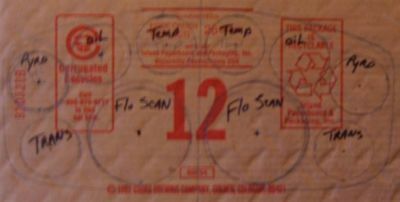 FloScan componets were neatly packed with detailed instruction booklet and even included a DVD. This is a first class operation! The installation process will be detailed in the engine room section of this website where the flow meters will be located. More Bling! 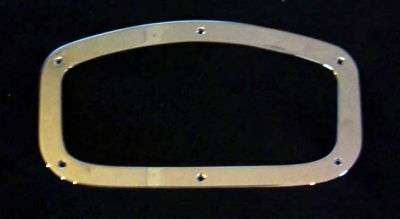 This is the stainless bezel from the new helm pod. The bezel shape was drawn on this cardboard and the layout of vital instruments was determined. A piece of teak will now be cut to use for mounting instruments. I feel it is important to have instruments arranged in a logical way so monitoring of vitals is natural. 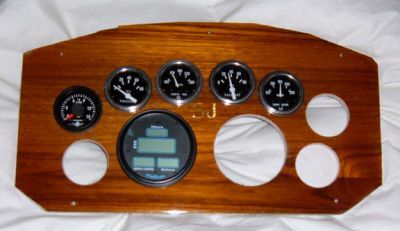 I also believe that the gauges should not be confusing by having more than one scale. These will use the USA scale only. 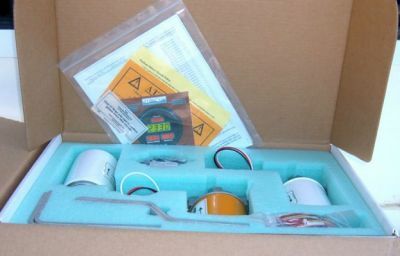 Pyrometer, oil pressure, water temp, water temp, oil pressure. The second pyrometer is on order as are the transmission pressure gauges that will fill the bottom left and right holes. The large instrument is the FloScan multi-talented gauge. The FloScan gauge provides RPM and a host of other information including fuel consumtion, gallons per hour, fuel used, etc. TW is concentrating on wiring the instruments. 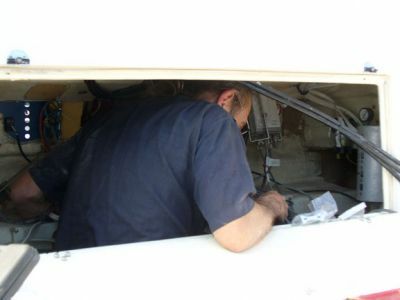 He is also cleaning up all of the wiring and finishing the hook-up to the FloScan and Glendinning controls. He's been in there a couple days. I am not sure he can get out. While the look is not bad we are having some issues. The Pyrometer came with a 7' wire, which had to be changed for this application. The Auto Parts supplier we purchased the gauge from was no help with this what-so-ever and SW support was lacking at best. The end result is that we do not have the Pyrometers working yet! Secondly, the oil pressure, water temp and Pyrometers are SW! We were unable to get the transmission pressure gauges from SW so we had to use VDO for them and the Pyrometer from SW was not available in the same bezel. The look is mixed but would be okay if they all worked. We are now talking with Livorsi about the Pyrometers and regret not talking with them from the beginning. They actually know what the instruments are for and how they work! 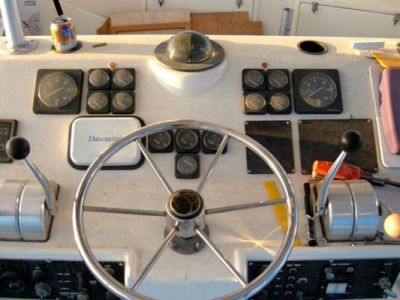 They also have every instrument you could possibly want to monitor your most expensive asset on the boat. Livorsi indicates that supplying a 30' and 40' wire for the Pyrometer is not a problem.